A new premium salad variety, bursting with flavour! 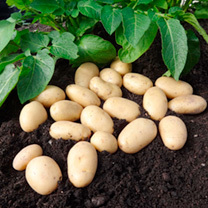 Lots of tasty small potatoes that are suitable for steaming, boiling, crushing and even roasting. RHS Award of Garden Merit winner. Salad type. Plant March-mid May; harvest June-mid August. Immediately upon arrival unpack your seed potatoes and keep them in trays in a light, airy, cool but frost free place for planting March/May. Plant into warm soil after the risk of frost has passed. Root development is best between 15 and 20ºC. Test by pushing your hand into loosened soil – if you can keep it there comfortably it is warm enough!